The creations of Ramón Ramirez of Edinburg, an artist and cartoonist who has lent his talents to celebrities and media organizations. EDINBURG — Memories are what’s left to cherish as Ramón Ramirez Jr. pushes forward with his artistry. Ramirez’s mother, Esperanza, died last November. He has a framed photograph of her near his workspace and recalls her being one of his biggest fans and followers since his childhood days. As he struggles to focus after the painful loss, the 48-year-old Edinburg native feels gracious about his mother supporting him through the years. His artistry includes being a head fine arts coordinator at Edinburg High School by day and a cartoonist by nights (and weekends). He is also the baby of the family with older sisters. The introduction into the art scene began with the assistance of his sister Eunice, who took him to the local library, and that’s where he discovered books and the imagination launched. When he was an adolescent, the family moved to East Texas, where his father, Ramón Sr. was a pastor and was transferred to a local house of worship and attended elementary school as well. The family moved once again during his pre-teen years to Illinois and attended middle and high school, but despite all those transitions of being located in the unknown, focusing on art became a sense of comfort. Ramirez returned to Edinburg the summer before his senior year to gain residency after being in another state for several years, graduating from Edinburg High School in 1987. His father then was assigned to Corpus Christi after his stint in Illinois and in the fall of 1987, he began attending Del Mar College and received his associate’s in arts before finally transferring to Corpus Christi State University (now Texas A&M University-Corpus Christi). 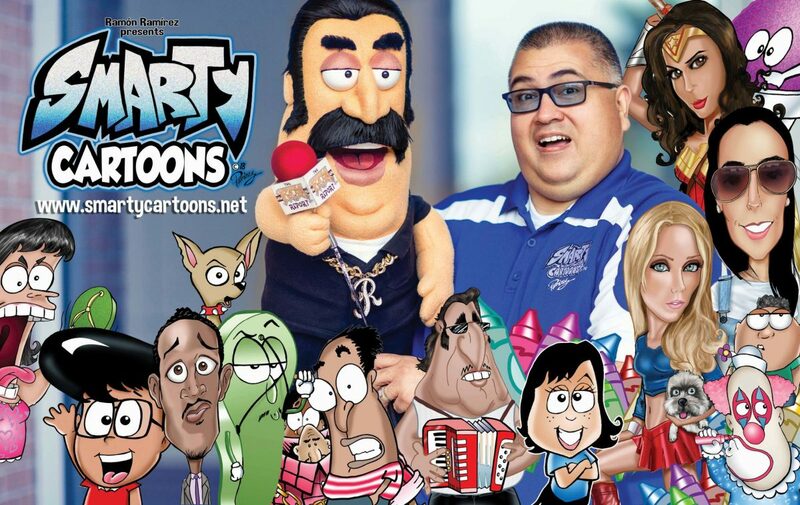 During his tenure at Del Mar College, Smarty Cartoons was also initiated in 1987 — that’s where he got his big break. The college newspaper eventually picked up his comics strips and at the same time, Ramirez gained his confidence. In 1991, Ramirez graduated from Corpus Christi State University with a degree in art and the following year became a teacher. As he was about to begin his first year of teaching, his father died. The Edinburg native said his parents were very supportive in his career. In 2001, he began collaborating with The Monitor and was told to be the eyes and ears of the Valley. Ramirez also does Teacher Toons, a whole other category that he began in 1999 and wrapped up in 2016 with the book with a mascot named Miss Carrie Oki, which is copied after his first-grade teacher and uses to describe the behind-the-scenes of teacher interactions at a school. “I never thought I’d be a puppeteer, but in doing animation, I was like this is hard and takes too long, and I thought what if I film something. I would film my dad’s church events,” he said. As an artist and a cartoonist, he carries his craft through the classroom, after-school and on weekends during the summers, because he says that’s what he loves. He has also been a role-model to the youth, in the subject that he has inspired children because they’re fascinated by his work and want to become an artist and want to know how to get started in the field. He also adds his knowledge and artist skills in the classroom. “I tell my students, don’t block your experience in being an artist; you’re going to need it whether it’s decorating your house, cake, wedding or clothes, business, business card or measuring something in your house,” he added. He has also worked with some celebrities like comedian and television actor Marlon Wayans, creating a show logo animation. What’s more, Ramirez has transformed actors into caricatures like Laura Vandervoort, Katrina Law, and Helen Slater. As Ramirez enters his 31st year as a cartoonist, he wants his audience to know laughter is key. “When you reach that level, you open up a good gateway to communicate, and it’s good to laugh,” he said. Ramirez also sends a message to the up-and-comers who want to aspire to be like him.